Be part of a community that believes in the power of entrepreneurship to create positive, sustainable social change. Your gift helps create and support saving groups. After their second year, groups can apply for funding for income generating ideas to become financially independent. Your support helps these businesses get on their feet in the first two years. With previous support, our community has successfully established savings groups in rural Uganda who are now setting up their own profit-making businesses. However, vital ongoing costs need your support. Our biggest cost is local salaries for staff who establish the savings groups and provide training, monitoring and support. Without these staff the savings groups will not be as successful. And it’s not just the existing groups who need your support, our community wishes to increase its impact through establishing more savings groups. 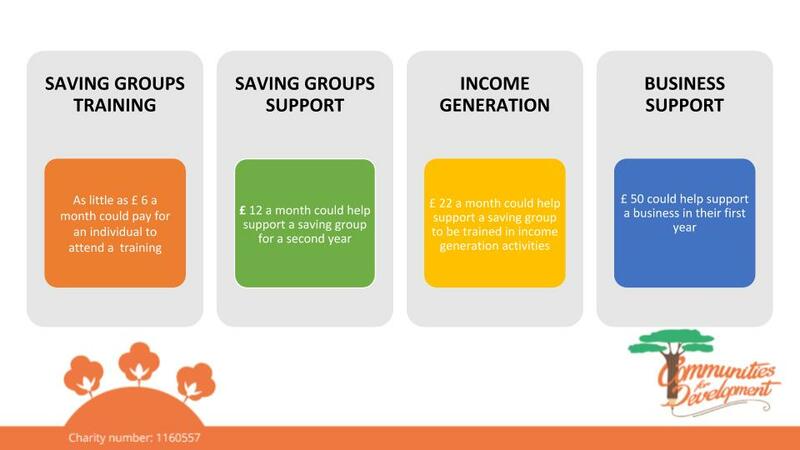 There are groups who are ready to start saving right now but who can’t make this change without your support. Our community believes in the power of business and entrepreneurship to create positive social change. Empowering economic freedom and sustainable financial independence – your gift is an investment to enable rural communities to bring dreams to life. Your support today will build long term financial independence for our community tomorrow —come join us!